Dwarf of Thorin & Company. Oin was born in 2774 of the Third Age. He was the son of Groin and the older brother of Gloin. They were of the line of Durin. Oin was a member of the company of thirteen Dwarves formed by Thorin Oakenshield in 2941 to reclaim the treasures of the Lonely Mountain from Smaug. Oin’s hood was brown. Like his brother Gloin, Oin was skilled at making fires using a tinder-box. Oin survived the Battle of the Five Armies and settled at the Lonely Mountain. 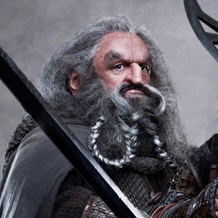 In 2989, Oin accompanied Balin on his quest to establish a colony in Moria. Five years later in 2994, Oin was killed by the Watcher in the Water at the West-gate of Moria. His death was recorded in the Book of Mazarbul which the Fellowship discovered in 3019.